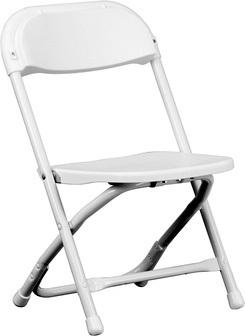 Kids White Plastic Folding Chair - Similar look to our adult white folding chairs, these chairs are great for the younger ones! Great for outdoor use. 200 lbs weight capacity. We can deliver or you can pick them up at our warehouse. We also rent tents, tables, table covers, and dance floors.